ASX-listed Reedy Lagoon Corporation have received approval to drill their interesting looking Big Smoky South Lithium brine project in Nevada. The aspiring Lithium brines developer told the ASX this week they had obtained approval from the US Bureau of Land Management to drill two exploration diamond core holes into the underground salty aquifers at Big Smoky South, one of three Lithium brines projects for which Reedy Lagoon holds rights in Nevada. The project is just 10kms from the Silver Peak Lithium brine project operated by US-based chemicals giant, Albemarle, better known in Australia as 50% owner of the Greenbushes hard rock Lithium mine. Albemarle were ahead of the times with Silver Peak which has been producing Lithium from underground salty aquifers since the late 1960s. More recently however, a string of junior explorers have started to focus on the region around Silver Peak given the significant advancements in Lithium brine extraction technologies. Sitting pretty amongst that group is Reedy Lagoon, which has developed an intriguing Lithium brines play of its own in the region through a combination of old-fashioned geological detective work and new technology. Reedy Lagoon managed to find a 1977 geological survey report commissioned by the US Department of the Interior relating to the region that Reedy’s projects fall within. The report is littered with references to Lithium bearing brines in underground springs, particularly near Reedy’s Columbus Salt Marsh project, about 40km from Big Smoky. Earlier this year, the company tested the theories contained in the old report by conducting magnetotelluric surveys, a rapidly evolving geophysical survey technique that can measure the electrical resistivity of waters in deep aquifers or reservoirs. The surveys can detect whether the ground waters are more conductive than usual, indicating the presence of salts and potentially high concentrations of minerals such as Lithium. 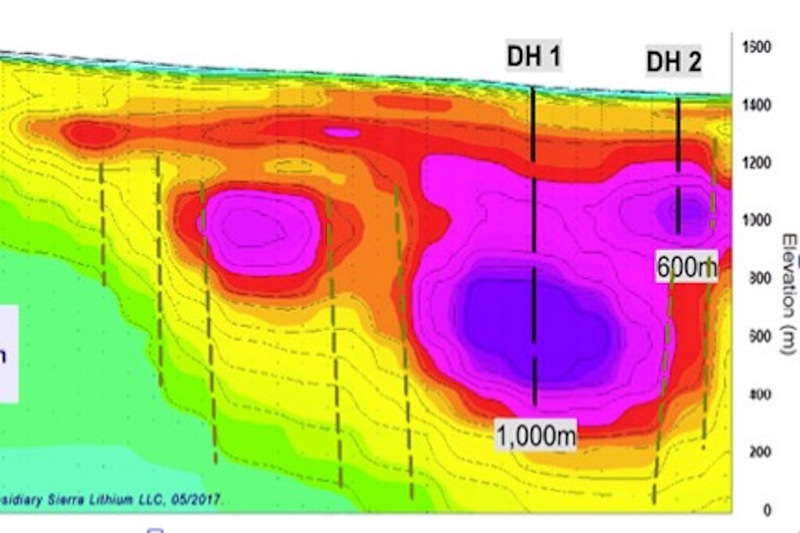 Reedy Lagoon’s surveys produced spectacular resistivity anomalies, ranging in depths from just 350 metres and presented the company with a number of compelling drill targets. Reedy now have drilling approvals for the Columbus Salt Marsh and Big Smoky South projects. A permit has been granted to pump up to 6 million litres of sample water from the Columbus Salt Marsh and similar approval is expected soon for Big Smoky South. If the campaign is successful Reedy will have the ability to make use of the drill hole as a production well at a later date. Unlike the Silver Peak mine, Reedy aren’t planning to build acres of evaporation ponds that take between 18 and 24 months to produce Lithium Carbonate. If they find an economic resource in Nevada Reedy are planning to use technology similar to that pioneered by Italian company Tenova Bateman Technologies known as “TBT” that does not require the use of expensive and expansive evaporation ponds. The timing of the drill campaign hinges on an upcoming equity raising and vendor share issue to complete Reedy Lagoon’s acquisition of the Nevada Lithium projects. The vendor share issue requires shareholder approval on 16 November, however management are wasting no time and will be a position to hit the ground running in Nevada as soon as the capital raise is complete.